For the first and only time in the history of the United States of America, Richard M. Nixon announced that he would resign the Presidency of the United States 40 years ago this evening. 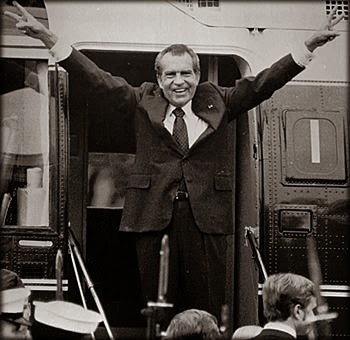 Nixon would have faced impeachment by Congress, and possible removal from office by the Senate due to a cover-up over the Watergate Burglary Scandal if he remained in office. Vice President Gerald Ford would assume the Presidency on August 9. Richard Nixon would go on and be regarded by both Democrats and Republicans as an elder statesman for the next 20 years until his passing in 1994. His skills in analyzing foreign policy were appreciated. The moon landing, ending of the Vietnam War, and opening to Communist China were what he is best remembered for.